The GOLD PRICE closed Comex $10.90 (1%) lower at $1,085.60. The SILVER PRICE fell 0.9% or 11.5¢ to $13.74. Why does this feel like déjà vu? Because we’ve been here so many times before. Gold’s performance in closing below $1,088 today can only be described as “sorry as gully dirt.” It’s not necessarily fatal, since it remains above its 50 and 20 DMA’s, but after it took the GOLD PRICE so long to punch through that wall, it looks weak and thin as orphanage oatmeal to fall back below it. Chart still shows an upside-down head and shoulders-y pattern, but the price of gold must turn up from here to preserve that. The SILVER PRICE is not as healthy as gold, languishing beneath its 50 and 20 DMAs. I have to say the same about silver: it must turn up from here, or drop much further. Of course today may be the product only of schizophrenic traders bounding from market to market. All the same, silver and gold prices aren’t immune form the rules of charting. When important support is broken, it’s weakness, not strength. On the other hand, I might be dumb as a post and missing the greatest opportunity ever to buy silver and gold on a low. I’ve just been burned so often in the last four years I’m hungry for proof. In a note to clients dated 8 January, the Royal bank of Scotland suggested that investors sell their stock and move money into high quality bonds. RBS says the world economic situation look like 2008 and pointed to China as the next catalyst of trouble. Ever wonder why banks and stockbrokers have “clients” while the rest of us have “customers”? The word “client” originally described a Roman plebian (Roman white trash) who lived under the patronage of a patrician (high class, i.e., rich, Romans). Clients used to cluster around their patron’s door and . . . Wait. Had to because clients were DEPENDENT on their patrons. And that’s the difference between a client and a customer. The client’s a dependent. Stocks tanked today after the open, and by 2:45 had lost 76 points to 16,322. Suddenly a buying panic seized — somebody — and by the close buyers had driven stocks up 117.65 (0.72%) to 16,516.22. The S&P500 also climbed a bit, up 15.01 (0.78%) to 1,938.68. Miss not this: it followed the same pattern. Sorry, I see no joy in Mudville, only a little bounce off the rocks during a longer cascade. Winners in stocks this year will be rarer than Hereford hogs with fine table manners. Look at the chart on the right for the scope of what’s happening. It’s a topping market breaking down, not one recovering. All this unfolds slowly because stocks are such a big market, so don’t get anxious. ‘Twill come. Watch for it. US Dollar index slowed its rise and gained only 8 basis points today (0.9)0. 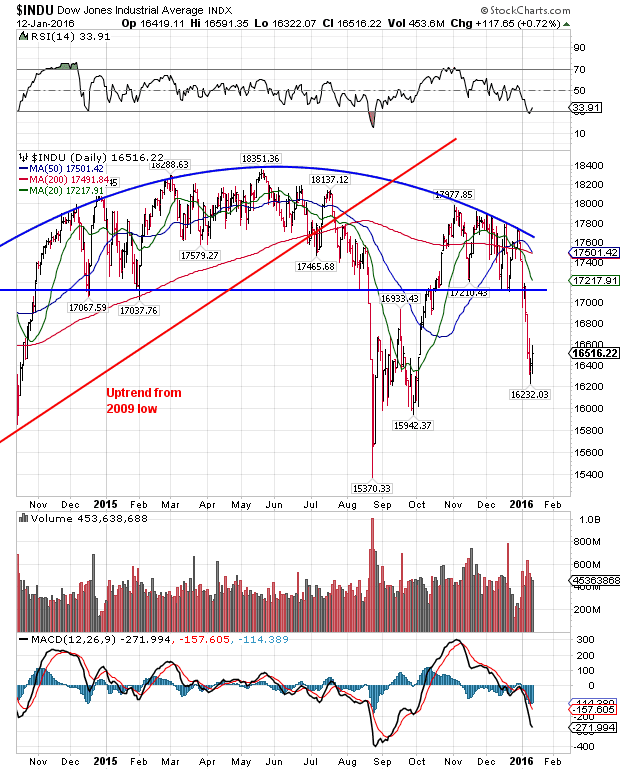 It is above its 50 and 20 day moving averages, and has risen three days running. however, you can’t say it’s trending up until it closes above 99.75. Dollar index is blowing hot and cold out of both sides of its mouth. Yen continues to push up. Rose 0.12% today to 84.99, up 1.5% for the year. That can’t make the devaluing maniacs at the Bank of Japan happy. How long can they stand it. ECB, on the other hand, has no trouble keeping its currency low. It rose a token 0.35 today to $1,0860, but is contained in a triangle and shows no inclination to break free. Makes me feel nasty all over just to have ot talk about fiat currencies. Oil dropped another 1.77% to $30.58 (WTIC). I reckon it is putting in its final bottom, which should happen some time this quarter, but it giveth no sign of reaching that yet. Copper is fainting too, down 0.86% to $1.96. 2016 should be the year that commodities turn up, probably helped by generous central bank money creation — but not yet.